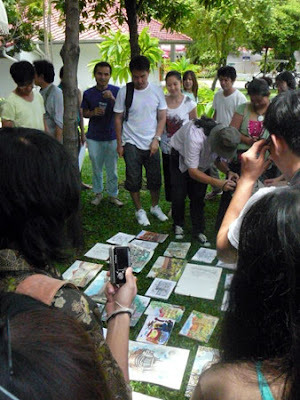 This time SketchCrawl in Bangkok were the fun gathering of smatching 40 people or so . We all met up in the morning at Vimanmek Golden Teak Palace with some new friends, old friends from Bangkok Sketchers group, and Architecture Preservation Club of Rungsit Univ. The sketchers were from 4 years old to more than 60 years old ... and from novice, hobbyists, to professionals. We all had fun sketching out and sharing many styles of sketches. Thank you very much to P'Asnee and Kwin for help co-ordinate the gathering. This time my family, all three of us, went out with my DH watching over my shoulder and over our 5 yr old, Iris. 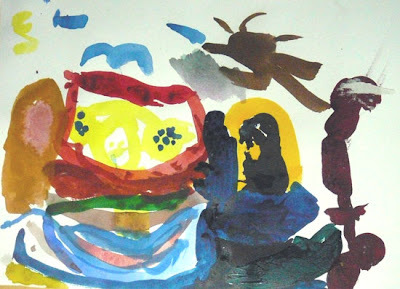 The abstract looking blob belongs to imagination of Iris. I did the other two of the palace. Pls. check back as there will be a lot more upload from other Bangkok sketchers. #1 The group and the on-site exhibit at lunch break. What a great turnout you had for the day! Looking forward to see the rest. What a beautiful watercolour by Iris! And yours too Ai. Look forward to seeing the rest. We still have 7 hours to go before we set out to sketch, it's too hot during the day so we'll do a Night Watch this time. Thanks so much Yvonne. Have fun sketching in Spain. 40 People - thats so exciting, especially the range of ages. You chose to draw a lovely, complicated building - great work ! thank you Ai and hello, all dear fella crawlers. it was nice to meet here again after a whole day fun, as ai said, in the sun! The best part was when we turned up for lunch as i was very hungry! The place we visited today is officially called Dusit Palace, consist of several large and small palaces and mansions with many of them are still in use for important ceremonial royal occasions. 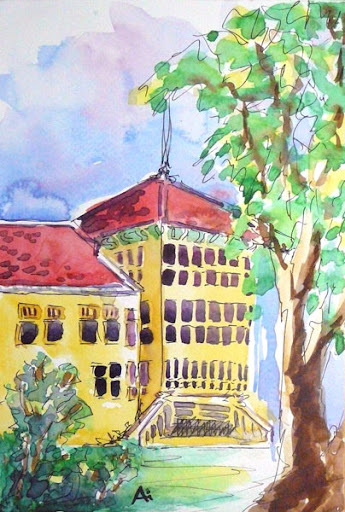 One of the main buildings includes the Vimanmek Mansion, a large two stories building built out of golden teak wood (but they were, from the beginning, it seemed, painted over with paint!) 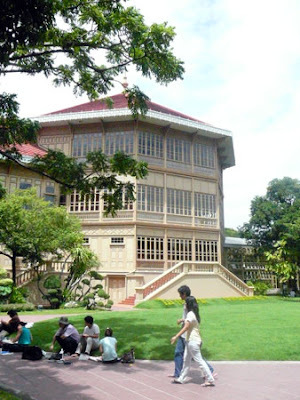 Built by the command of HM King Rama V in 1900, some part of the building used materials brought over from the king's former residence building from Sichang Island. I did 2 smallish drawings and 2 of 7x11" watercolor, none of them was really finished as I was so much distracted by the on going chaos, created by many large groups of tourists! A view of a small pedestrain bridgen along the compound's driveway. As Ai mentioned, do come back as there will be many more from Bangkok in the next day or two. I am eagerly waiting to see them here myself as I know for sure that many of them are just fantastic. P'Asnee, gorgeous on all, but I especially love the two mixed watercolor with NeoColor sticks. The colors just sing... and vivid. -- Bangkok rocks the full colour palette again! Thanks for sharing these strong pictures! Congrats to all the participants, specially to Iris. I like very much the way you apply colours! You have such great things to draw there. Such vivid drawings and variety! Great sketches, Ai, Asnee, and of course, Iris. Wow! It must be a lot of fun sketching with a group of 40. My sketchcrawls are generally either myself, or myself and Joan. Asnee, I like your "continuous line" drawing. It has a wonderful flow to it. And thanks p Ai and Asnee for introducing us here. Here is my first sketch, I tried to capture the tourists' activities. The visitor who wear shorts will be asked to cover them with sarong- that's why it looks like everyone is wearing the long dress. 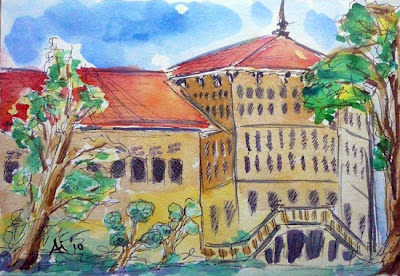 The second sketch, done in the afternoon, is of the Abhisekdusit mansion which I've never realised so beautiful. First it is its scale, then its delicate lattice work (think Alhambra without courtyards). I missed the interior because of the time (yes, we got the sketch round up at 4pm) but surely I'll return to visit. This view is of the back porch. I'm an architect and advisor of Architecture Conservation Club of Rangsit University. Yesterday was so funny weekend with Thai Sketcher, thank you mr.Asnee for inviting. 25 members of us were 1-4 year Arch students, grade 12 student (my daughter) and 19 years graduated - old student ! 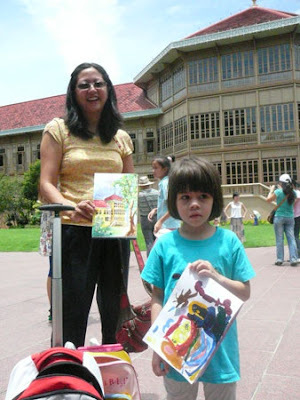 We are enjoy with the place and the exhibition too much, that's why not have much drawing. more drawings will be post soon by themselves. Last edited by sudjit on Sun Aug 01, 2010 4:00 pm, edited 7 times in total. Very beautiful vivid color,and nice atmosphere...!